Be in generally good health and feeling well. Drink plenty of water the night and morning before you donate. Eat breakfast to help keep your blood sugar up. Eat iron rich for example, spinach, whole grains, eggs, and beef. Avoid smoking on the day before donating. You can smoke 3 hours after donation. Ask for a blanket if your hands or feet start to feel cold. Have a snack after the donation. Rest for a few minutes enjoying your snack before leaving the donation site. Eat a meal high in protein after your donation: beef, chicken or legumes are excellent choices. 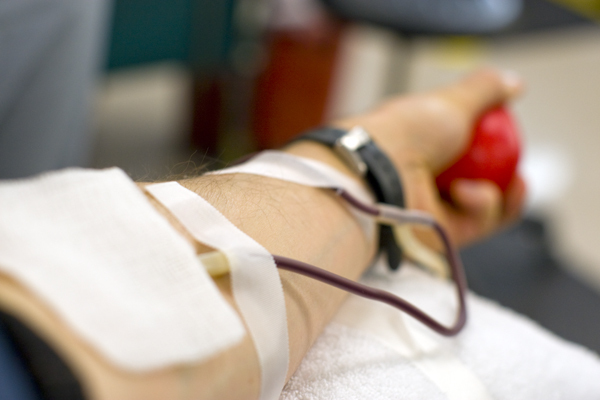 You will not be eligible to donate blood if you have consumed alcohol 48 hours before donation. Avoid heavy lifting and strenuous exercise for the rest of the day. Will I feel tired ? Will I be bedridden for the rest of the day ? You can resume all your normal activities, though you're asked to refrain. Will I be in danger of having low blood ? If you are verified to donate by the doctor you will still have surplus blood after the donation. Ahh - Syringes ! How much will it hurt ? No, you will not feel any pain. Does one feel dizzy after this ? You will not faint or feel uncomfortable after donating blood. Oh My God ! I'll get AIDS ! No! Make sure disposable syringes are used and all measures are taken to keep you germ free.